So far in 2003, we've received a number of self financed albums here at MetalReviews. Most of these albums have been surprisingly good. Some have even signed record deals shortly after we've had the pleasure to listen to and review to their work. Citadel, Trivium, VII Gates, and Misery Inc. are the first that come to mind. Black Steel and Holy Martyr have also released impressive self financed albums that will certainly draw attention from the industry as well. Another self financed cd has been spending lots of time in my stereo lately. This time, it is a unique melodic metal band from Australia. Voyager is a five piece band with a very pleasing and unique sound from the land down under. From the sounds of this album, you might think that this band is a group of mature, seasoned veterans of the music industry. As I said, this is a 14 track self financed album from these five talented musicians that surely will see success in the near future. Like the sound, the entire promo package for this album is very professional in nature. The music itself has a very unique flavor. Taking elements from power metal, hard rock, and even melodic death metal, Voyager have come up with a sound that is refreshingly all their own. The band is fronted by 20 year old Daniel Estrin. Not your typical high pitched power metal vocalist, Estrin maintains a mid range delivery throughout the entire album. While he doesn't boast an incredible range, Estrin's vocal performance is highly emotional, providing the heart and soul behind the songs. To give you an idea, his range is pretty close to that of ex Falconer vocalist Mathias Blad. Although his voice is warm and melodic throughout most of the album, there are a handful of brief moments where he uses a death growl when the mood of the music turns angry. This proves that the young Estrin has a diverse voice, which is an asset to this band. Those of you who worship the twin guitar lead will find a lot to like in this album. The perfectly synchronized twin guitar leads of Emanuel Rudnicki and Mark De Vattimo dominate the album, drawing the obligatory Iron Maiden comparisons (especially the lead following the pompous keyboard intro in Towards Uncertainty). Furthermore, Rudnicki and Vattimo lay down a constant supply of meaty riffs and energetic solos that help shape each of the songs into memorable ones. Vocalist Daniel Estrin also handles the keyboard duties for the band and does so quite well. The keyboard textures help to carry abundant melodies throughout the album and to establish varying atmospheres for each track. The songs cover a wide spectrum from uplifting, powerful tunes to dark and ominous tunes, not to mention a couple of angry tunes the briefly touch on melodic death metal. It is very evident that the band has put a great focus on song structures. Each song stands up on its own, and there is truly not a dull moment to be found. With the varying moods throughout the album, the terrific twin guitar leads, and the instantly recognizable melodies throughout the album, Voyager already seem to have the ingredients for a successful band. The energy level never drops, and the diverse keyboard textures take the songs to the next level. As I said, the musicianship and songwriting ability is remarkably well developed for such a young band. Also, the album is well produced, completely disguising the fact that this is a self financed effort. 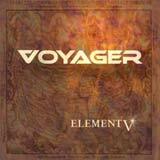 If I were a betting man, I'd put my money on this Element V opus securing a label for Voyager by the end of the year.